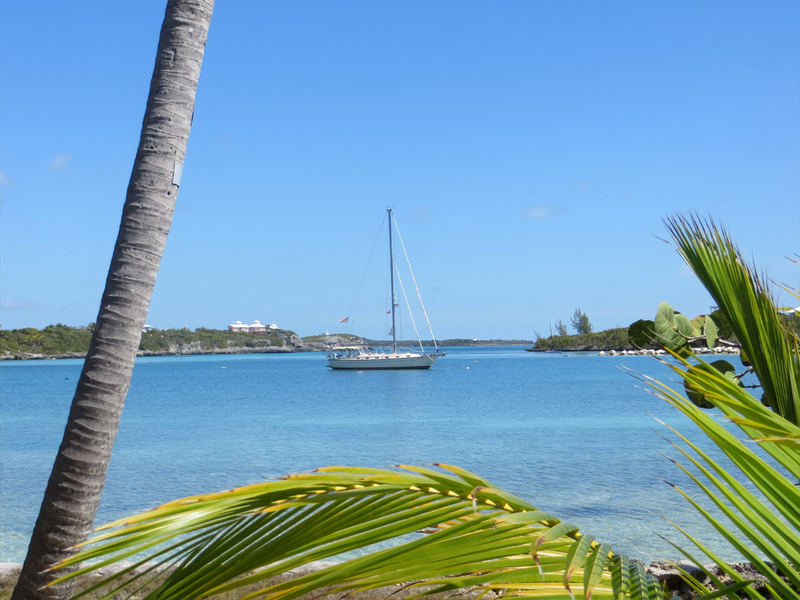 At 0630 on Wednesday, April 22nd, the anchor is up at Royal Island for the 62-nautical mile run to Little Harbour in the Abacos. Today’s cloudiness is associated with a persistent TROF that influences the local weather picture. This morning, the wind is calm and the seas are flat. 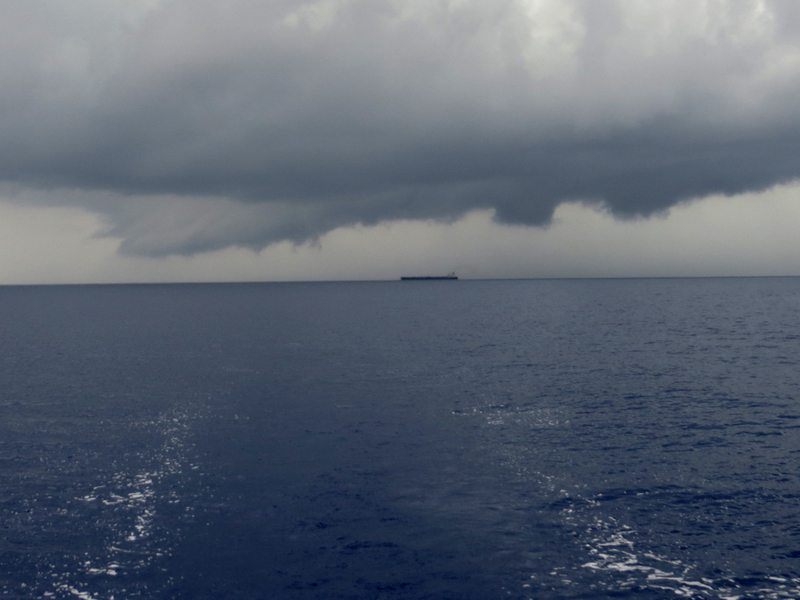 However, dark, low-hanging clouds hover over the waters of the Atlantic Ocean between Eleuthera and Great Abaco Island. These squalls create their own weather, gradually increasing the wind speed to 15 knots. The wind builds, then diminishes as the squalls migrate to the east. Brighter skies to the north offer hope for improving weather. At 1530, Cutter Loose leaves the waters of the Atlantic Ocean astern and enters the Sea of Abaco through the cut at Little Harbour. The tide is falling rapidly as we inch our way into the narrow channel that leads to the inner harbor. With any amount of luck, there will be sufficient depth to carry our draft of five feet. 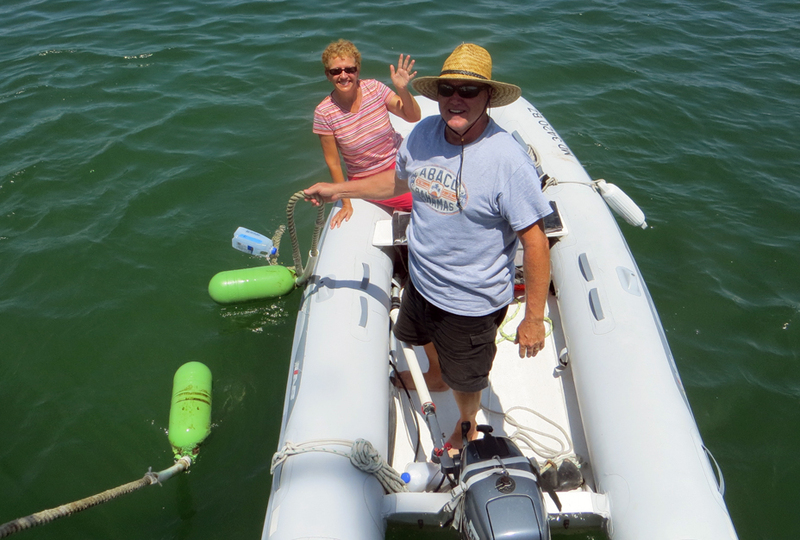 At the very first pair of channel markers, Cutter Loose eases to a gradual stop. We are aground on a soft sandy bottom in the middle of the channel. Despite the valiant efforts of several passing powerboats to nudge Cutter Loose off the bar, she refuses to budge. Several cruisers in the harbor notice the commotion and dinghy alongside to offer support and encouragement. It is now 1600. Low tide is at 1800. Thankfully, the wind is light this afternoon as we settle into relaxation mode, waiting for the rising tide to lift all boats. At precisely one hour after low tide, there is sufficient water depth to float off the bar and into the inner harbor to the enthusiastic applause of our fellow cruisers. 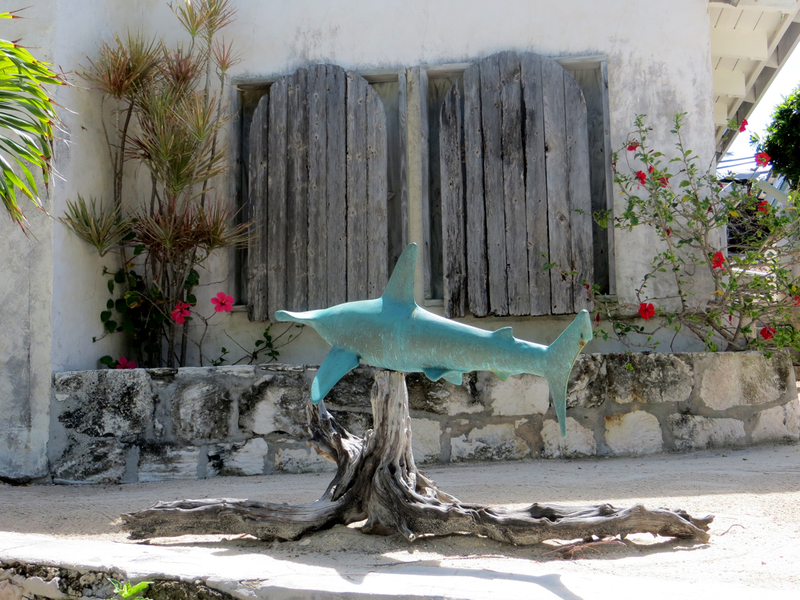 It is comforting to return to the familiar surroundings of the Abacos. Our dramatic arrival at Little Harbour completes a circle that began when we visited here on March 23, 2012. Following a crimson sunrise on Tuesday morning, we venture ashore for exercise and exploration. After a stroll along the beach and a visit to the gallery at Pete’s Pub, the anchor is up in Little Harbour at 1130, about an hour before high tide. Water depths in the channel this morning are in excess of seven feet, making for an easy and uneventful departure. 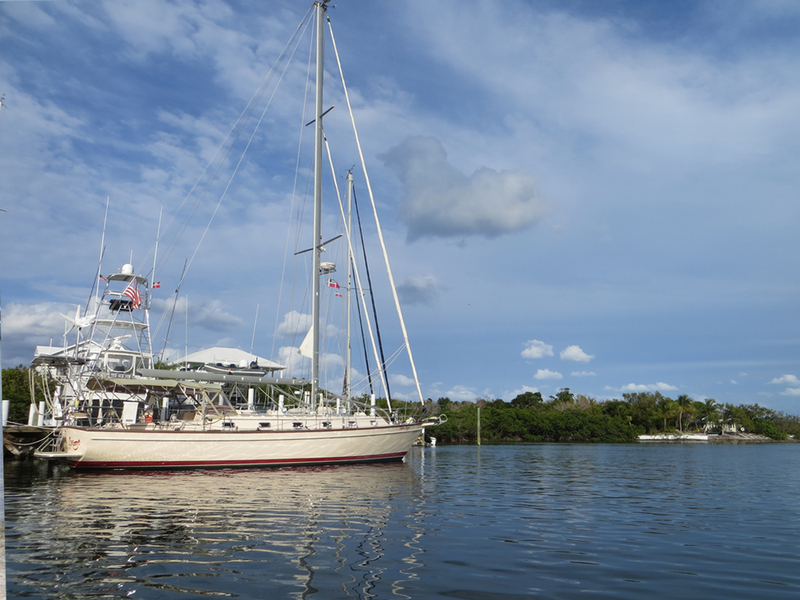 Our course takes us north in the Sea of Abaco past the Pelican Cays Land and Sea Park to a restful overnight anchorage in the lee of Tilloo Cay. This spot serves as a staging area for Wednesday morning’s short run to Hope Town via Lubbers Quarters Channel, which must be transited on a rising tide. Once abeam of popular Tahiti Beach, water depths increase gradually on the approach to Hope Town. 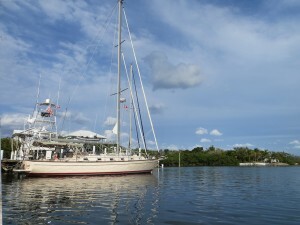 Inside Hope Town harbor, Cutter Loose is escorted to her mooring ball by none other than long-term cruising friends Radeen and Hayden aboard Island Spirit. This is a long-awaited, highly anticipated reunion. 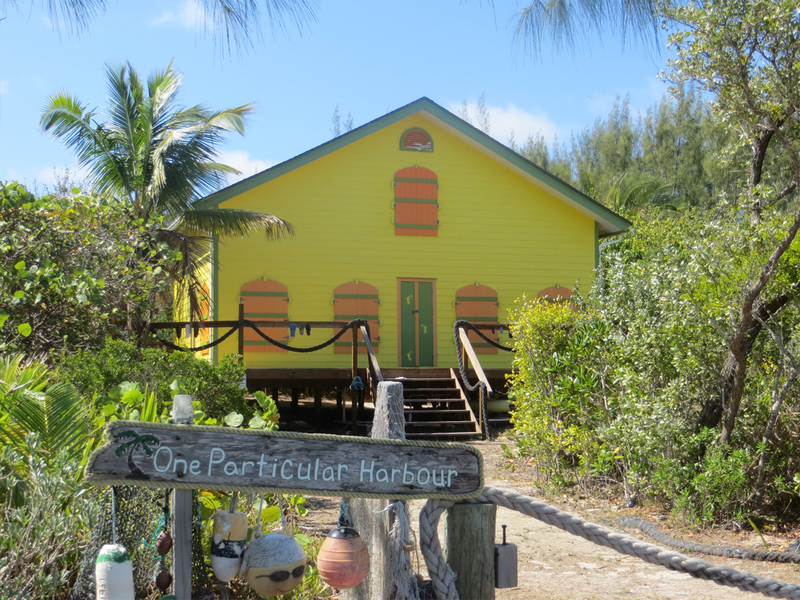 In 2012, we explored the Abacos with Hayden and Radeen, returning again and again to the protection of the harbor and the lovely shore side amenities of Hope Town. 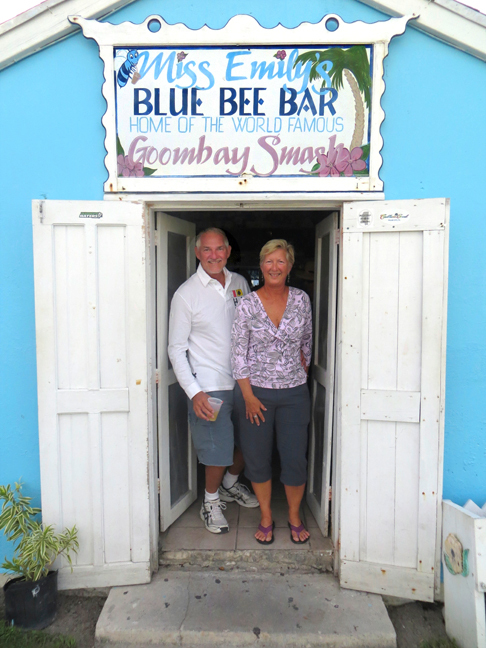 Since 2012, our cruising itineraries have taken us in different directions but have brought us back to this same spot that we enjoyed together during our maiden voyage to the Bahamas. 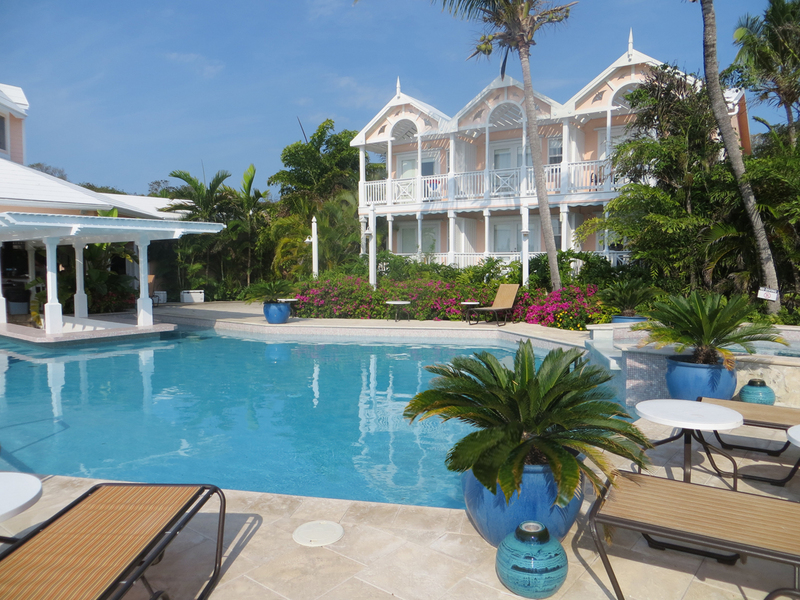 Our rendezvous today begins a celebration that spans several days, including morning visits to the Starbucks-style Hope Town Coffee House, hiking around Elbow Cay, relaxing at the pool, strolls along the beach and swapping sailing stories over meals and beverages. It feels good to be reunited with close friends. 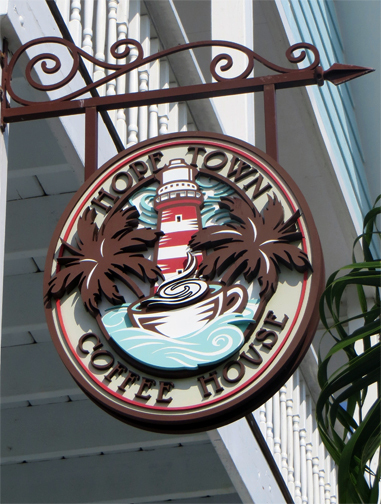 Hope Town is a delightful destination with an interesting blend of brightly colored, Bahamian architecture and U.S. coastal resort amenities. 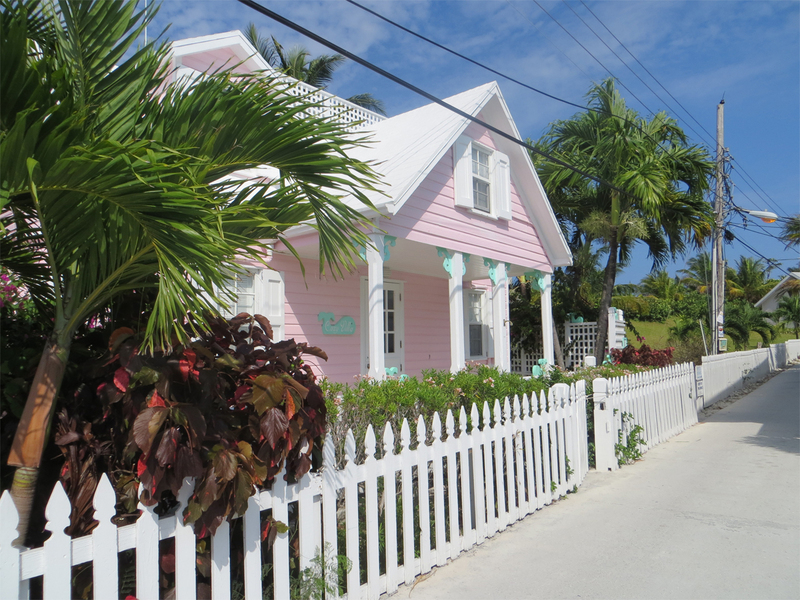 Its narrow lanes with white picket fences, colorful plant material and quaint cottages impart the aura of an English, seaside village. 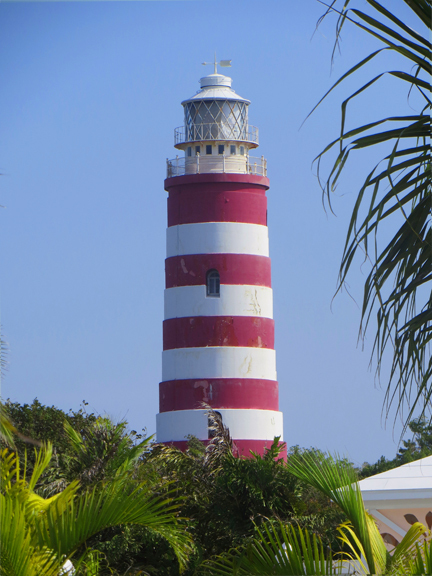 With its iconic lighthouse standing watch over the harbor, Hope Town is somewhat more refined than funky-cool Dunmore Town on Harbor Island, Eleuthera. Trendy shops and American television are vivid reminders that the great shopping center to the west is nearby. 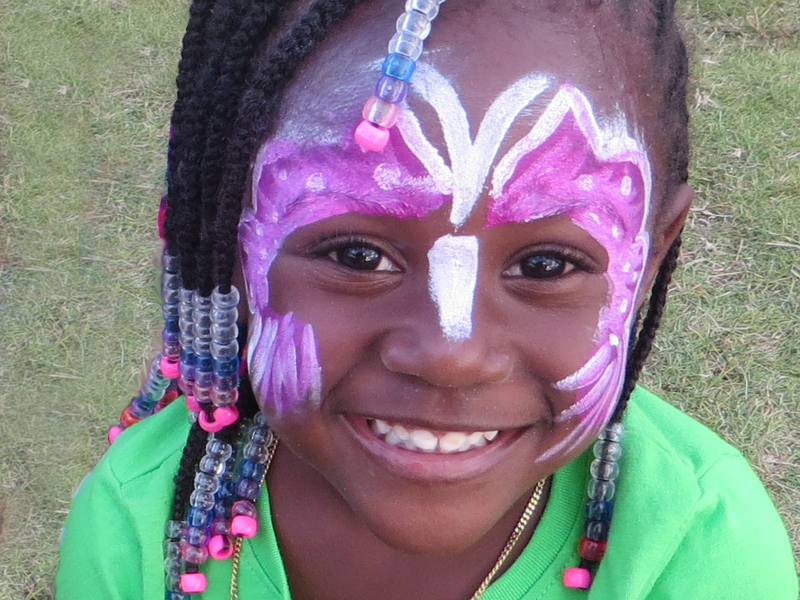 Tied to a mooring ball in Hope Town, life is carefree and sweet. While in Hope Town, a routine oil change aboard Cutter Loose leads to the discovery of sea water that has accumulated in the bottom of the engine pan. This begins the process of narrowing down the source of the leak. The primary suspect is the raw water pump which circulates seawater through the engine for cooling purposes. The pump is functioning, but it shows signs of discoloration and corrosion from seawater. The repair must be effectuated before the forthcoming ocean passage from Abaco to Charleston, SC. Thankfully, it is a short, 7-mile run on Tuesday, April 28th to the local, factory-certified Yanmar dealer in Marsh Harbour. Within minutes of our arrival, Dennis, the chief mechanic, confirms our diagnosis of a faulty raw water pump. Miraculously, he happens to have the exact replacement pump in stock. 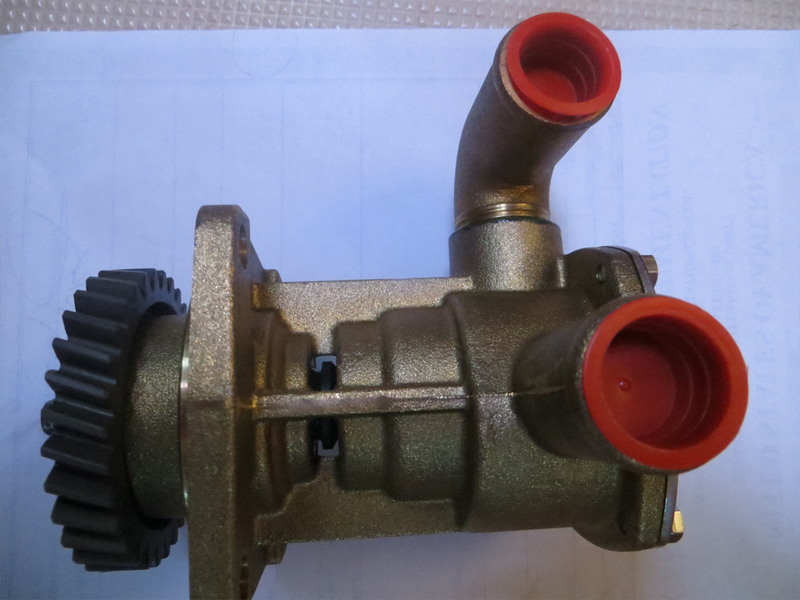 This eliminates the costly and time-consuming process of ordering and shipping a replacement pump from the U.S. Coincidentally, Dennis was formerly employed by Gratitude Marina in our home port of Rock Hall, MD. On Wednesday morning, April 29th, the old pump is removed and the new pump is installed. By noon, Cutter Loose is underway to Marsh Harbour. This is perhaps the most efficient engine repair experience known to mankind. However, upon further inspection at the time of our arrival in Marsh Harbour, more sea water has accumulated in the bottom of the engine pan. Clearly, the problem has not been completely solved. 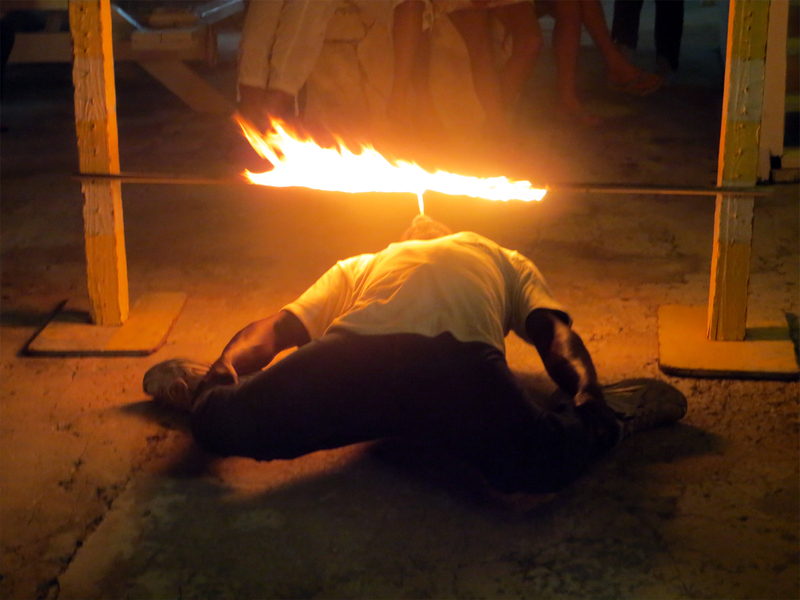 Our disappointment evaporates on Wednesday evening with a Bilge Burner (rum drink) at the Jib Room, followed by a buffet dinner, live Rake ‘n Scrape music and a limbo performance. On Thursday morning, April 30th, we beat a hasty retreat to Marsh Harbour Boat Yard for a follow up visit with Dennis. On further inspection, a broken hose clamp is discovered under the mixing elbow. This clamp is hidden by a protective asbestos wrap. Once diagnosed, this is an easy and rapid fix. By 2 PM, Cutter Loose is resting at anchor once again in Marsh Harbour . This time, re-inspection reveals a dry engine pan. We can now approach our journey to Charleston with renewed confidence that the engine is functioning properly. The weather is settled on Friday, May 1st. 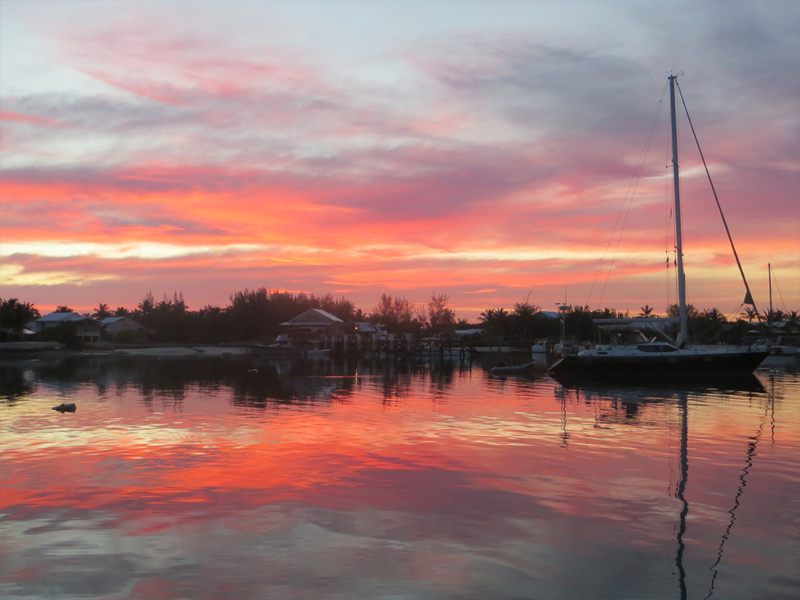 This is an opportune time to leave and return to the Sea of Abaco by way of Whale Cay Cut. 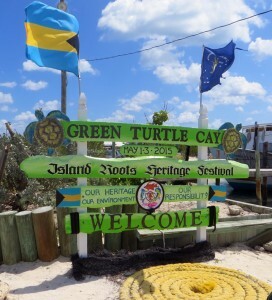 Our destination today is Green Turtle Cay where we will settle in and wait patiently for a weather window to the U.S. The forecast is clouded by the threat of severe weather during the week of May 3rd. With this factor in mind, Black Sound is the harbor of choice to ride out a storm. At mid-tide rising, there is sufficient depth at Rocky Bar to enter the long, slender fiord called Rock Sound. 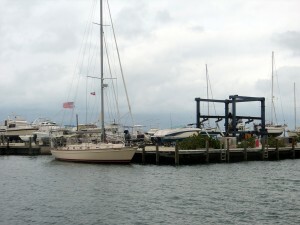 Cutter Loose is one of five Island Packets docked at Leeward Yacht Club, including Hayden and Radeen aboard IP 35 Island Spirit and Greg and Sharon aboard IP 40 Dreamcatcher. Not only does the marina offer excellent protection from wind and wave, it is also within easy walking distance of New Plymouth. 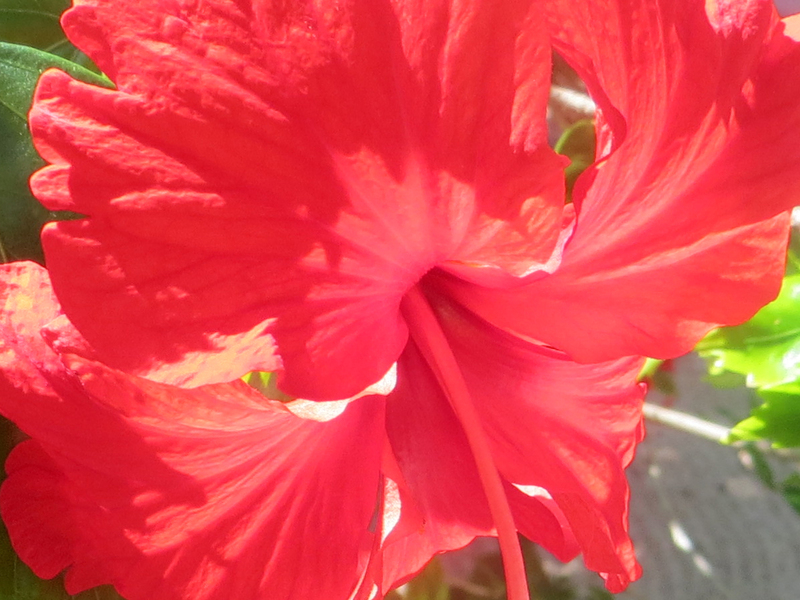 This weekend, New Plymouth is host to the annual Island Roots Heritage Festival. 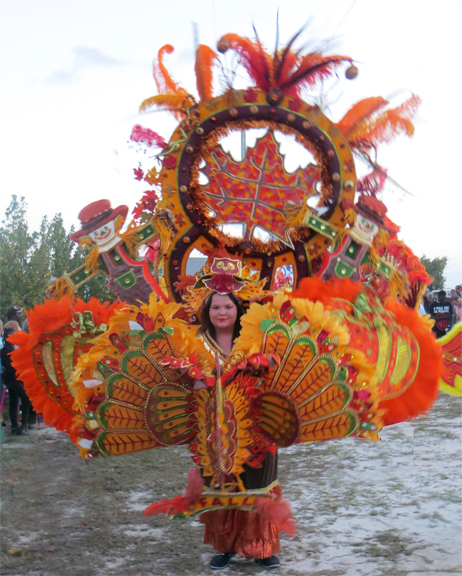 Each day, concerts and other events keep both islanders and visitors alike entertained. En route to the festival on Saturday evening, our merry band of cruisers pauses at Miss Emily’s Blue Bee Bar (birthplace of the world famous Goombay Smash) to celebrate Greg’s birthday and to view the Kentucky Derby on TV. 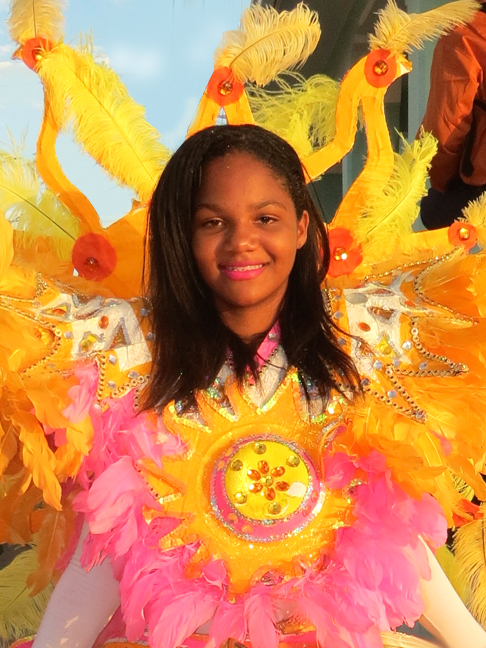 Later in the evening, a Junkanoo ensemble from Marsh Harbour entertains the crowd with a colorful procession of costumed dancers and musicians through the streets of the Settlement . 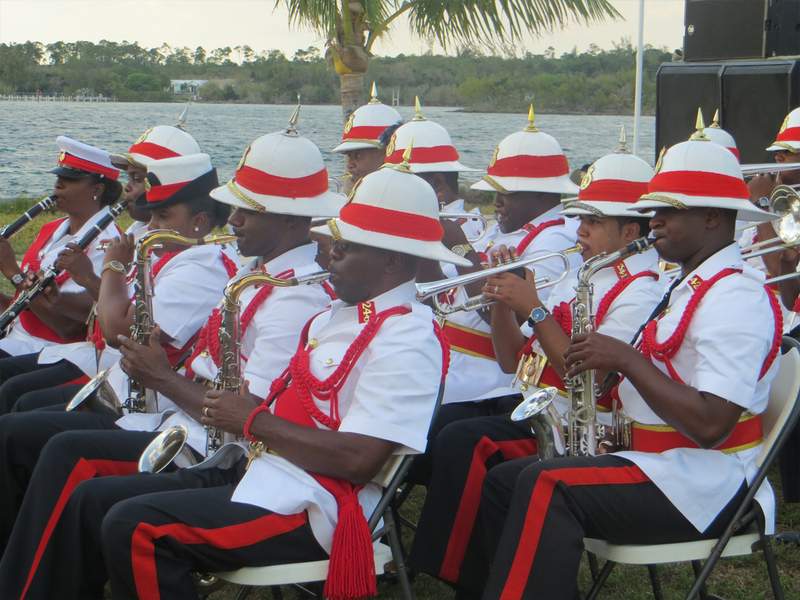 This act is followed by the Gully Roosters, the most popular band in the Abacos. 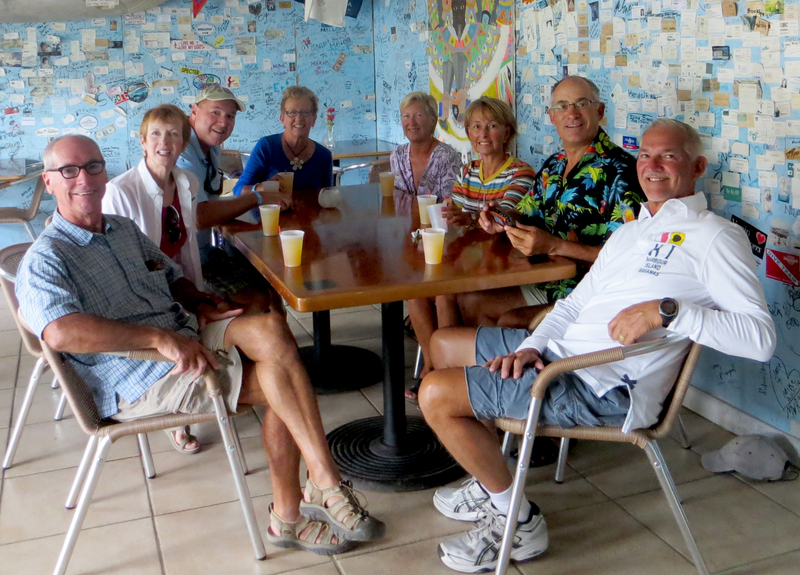 Each day while docked at Leeward Yacht Club, the weather forecast seems to change from bad to worse. A stalled frontal TROF that has been hovering over the Bahamas for more than a week will become more organized as it lifts back to the north. By mid-week, this system is expected to develop into a tropical storm with winds in excess of 39 knots. Since a tropical storm is a rare occurrence at this time of year, the computerized, forecasting models lack the benefit of history to predict the path and intensity of the storm. 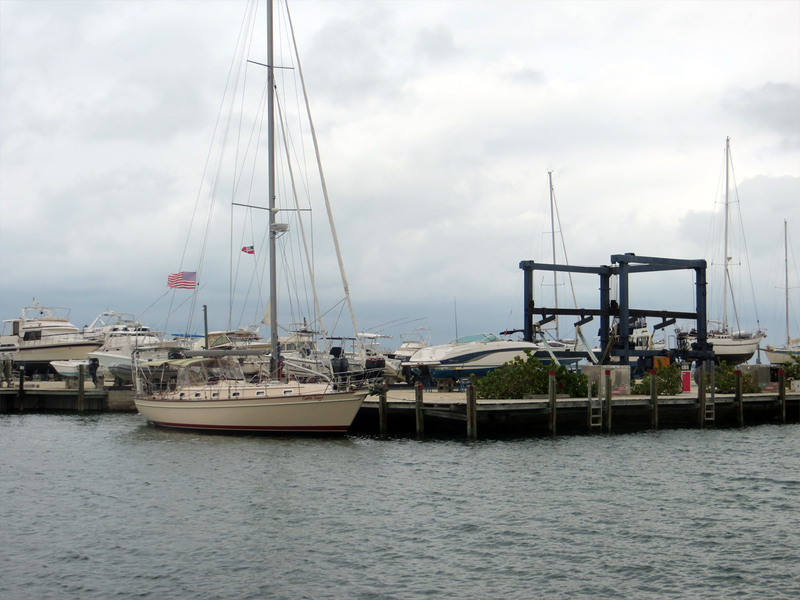 We are in good company here at Leeward Yacht Club where there is pent up demand for conducive weather to accommodate Gulf Stream crossings to various ports on the U.S. east coast. The marina is filled with cruisers craving the latest weather information. This waiting game will continue until the forecast becomes more definitive. 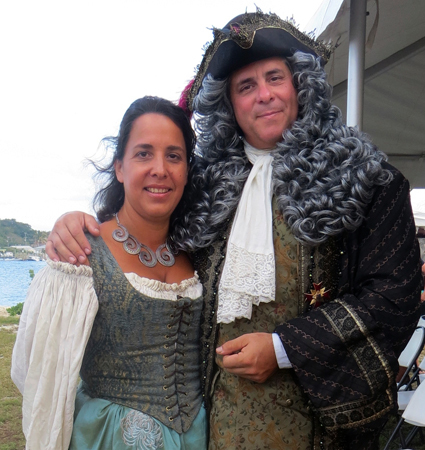 In the meantime, hikes to the beach, a stroll through the New Plymouth Settlement and afternoon Mexican train dominoes at the marina provide opportunities for exercise, entertainment and cruiser interaction. On Monday evening, May 4th, the weather turns ugly, producing high winds, heavy downpours, thunderstorms and squalls which continue non-stop throughout the day on Tuesday. Soggy conditions give way to clearing skies on Wednesday afternoon. Ever so gradually, the mystery involving the track of the tropical storm Ana is unveiled. The low pressure core of the storm is expected to make landfall on the Carolina coast sometime during the weekend, then lift north to Cape Hatteras early next week. Improving weather in the northern Bahamas will facilitate our departure for the U.S. east coast this weekend. 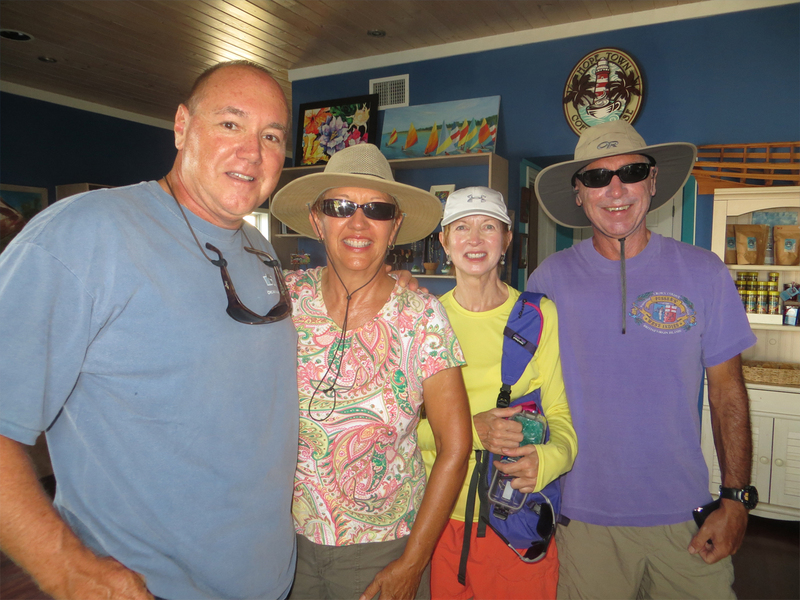 Due to events beyond our control, what was intended to be a whirlwind, one-week tour of the Abacos has evolved into a three-week stay. Never in our wildest imagination would we have expected to encounter a tropical storm during the first week of May. But our extended visit here has provided other tangible benefits, not the least of which has involved the opportunity to spend quality time with old friends and form new friendships. Such is the nature of the cruising lifestyle, where unexpected events frequently result in the most treasured of memories. On Friday, May 8th, Cutter Loose departs Green Turtle Cay, bound for the great city of Charleston, SC. 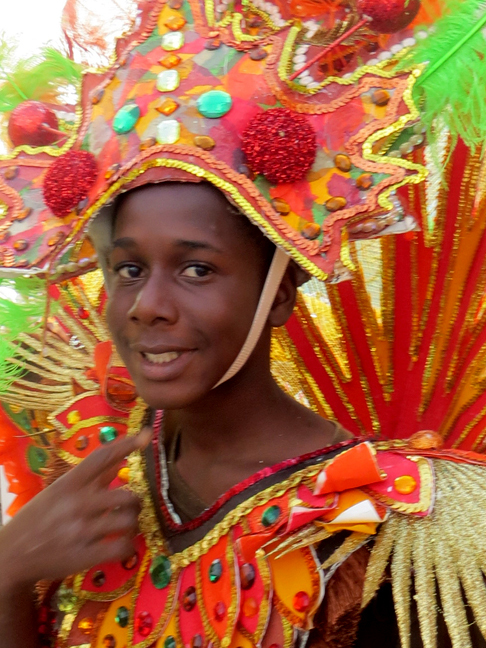 This entry was posted in Caribbean Cruise 2014 -2015. Bookmark the permalink.